A Dublin mother, who was only told in July she was a victim of the CervicalCheck scandal, lost her battle to cancer at the weekend - just hours before Emma Mhic Mhathúna passed away. The double tragedy brings the death toll among women caught up in the crisis from 18 to 20 in just two days. The Dublin woman, who wished to remain anonymous, is believed to have had multiple wrong smear test results over a number of years before getting a cervical cancer diagnosis. She had already been diagnosed with cancer when the HSE announced in July the number of women who received wrong results - and were subject to internal audit reports - rose from 209 to 221. Her condition deteriorated in recent weeks and she died in St Vincent's Hospital on Saturday, leaving her family grief-stricken. Vicky Phelan, the Limerick mother whose case first exposed the existence of the audits, revealed they had said goodbye to each other last Wednesday. Ms Phelan, who was in the same hospital for drug treatment for advanced cervical cancer, said: "I knew her and I met her daughters. It is close to home for me at the moment." 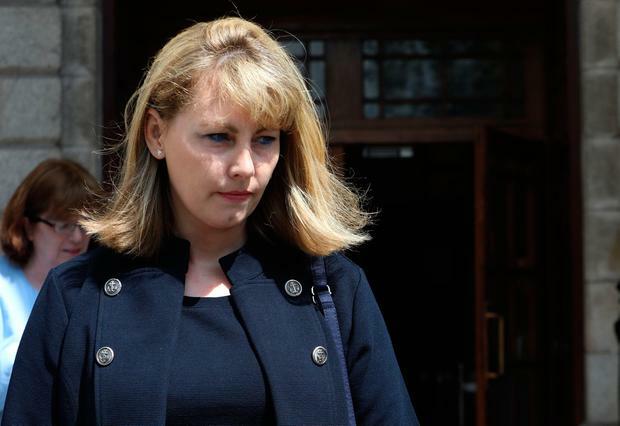 Ms Phelan said Ms Mhic Mhathúna, who died on Sunday morning and leaves behind five children, received a financial settlement but no accountability from the labs which negligently misread two of her tests. "We will keep fighting that corner for Emma and for other women," she said. The failure of CervicalCheck to order an investigation to find out the causes of the two negligently read tests was also deplored by Ms Mhic Mhathúna's solicitor, Cian O'Carroll. He called on CervicalCheck to order the Health Information and Quality Authority (Hiqa) to find out what went wrong. A spokeswoman for the HSE said Dr Gabriel Scally in his report on CervicalCheck had said: "All of the laboratories visited by the scoping inquiry are meeting the regulatory requirements in their own country. "The inquiry considers there is no reason, on quality grounds, why the existing contracts for laboratory services should not continue until the new HPV testing regime has been introduced." She said the external review of labs is currently under way by the Royal College of Obstetricians and Gynaecologists. The HSE said intensive negotiations are ongoing in relation to the extension of the contracts with both laboratories. The two main laboratories examine more than 260,000 smear tests a year under the national CervicalCheck screening programme. It's understood that these negotiations are at a critical stage and every effort is being made to ensure continuity of the cervical screening services. It's believed that one of the issues is higher insurance costs to cover a backlog of tests, which is under discussion. The scandal emerged when Vicky Phelan settled a High Court action against the HSE and US laboratory Clinical Pathology Laboratories for €2.5m over incorrect smear test results from 2011, which said that her smear was free of abnormalities. Explainer: CervicalCheck scandal - what happens next?